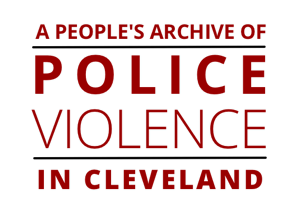 A People’s Archive of Police Violence in Cleveland collects, preserves, and shares the stories, memories, and accounts of police violence as experienced or observed by Cleveland citizens. Organized in Summer 2015 by Cleveland residents and professional archivists from across the U.S., the archive hopes to provide the Cleveland community--especially survivors of police violence and the families of victims-- a safe and secure space to share any testimony, documents, or accounts that narrate or reflect on encounters or effects of police violence in their lives and communities. Click here to add your story and upload files to the archive. You can help document police violence in our community.